Passion and talent are the key ingredients. There has to be a love for the effect that your talent has both on your life and those around you for a singer to get started. Most performers work at their craft, honing their voices, for many years before their skills really start shining through. There are a select few, however, who are blessed with some uncanny ability from the first time they exercise it and public notice is usually quick in coming. 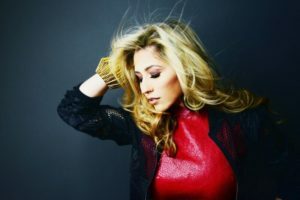 Brielle Von Hugel has worked hard to reach this place and has benefitted enormously from exposure on massive television hits with her Season 11 appearance on American Idol at the age of sixteen. She sang in public far before then, but a high profile spot like launched her to another level entirely. The uploads on her YouTube channel have proven to be quite popular and even garnered the notice of numerous figures as well as important media outlets. She’s set to release her second EP and the first single from that effort entitled “Naked” is a bold step into an even brighter future. It’s impressive anytime a singer places enough confidence in their voice and the material that they are willing to sing with only a piano backing them. Von Hugel does that here and rolls with cascading piano lines through the four minute plus track, coaxing certain lines to fruition, bringing the emotional highs to their fullest potential. She hits the chorus and bridge alike with such emotion that even the casual music fan will take notice of her skill. She shows a lot of connection with the lyrics and never delivers any of its lines with too much melodrama. Instead, the song’s depiction of someone letting go of their fears and learning to be comfortable with revealing who they are for the first time doesn’t cheat the listeners in any way. There are even a handful of unexpectedly poetic moments where the wording is, at least, striking enough that Von Hugel’s vocal can take full advantage of the moment. The balance between her voice and the piano playing is well handled and the production gives both instruments an inviting sound, never harsh, but definitely invested with a strong “live” feel. The piano never pushes its agenda too much and, instead, subtly takes a supporting role to Von Hugel’s voice and really excels at providing valuable counterpoint for her. The two talents working in perfect tandem like this, along with the great sonic presentation, gives the song an almost exultant feeling. There’s some real sense of exhilaration surrounding Brielle Von Hugel at this point in her career. “Naked” provides clear evidence that her next release finds her tackling material better than ever before and setting the stage for her next leap into greater notoriety. It has everything you want from the best popular songs while still having an impact reaching beyond any label.